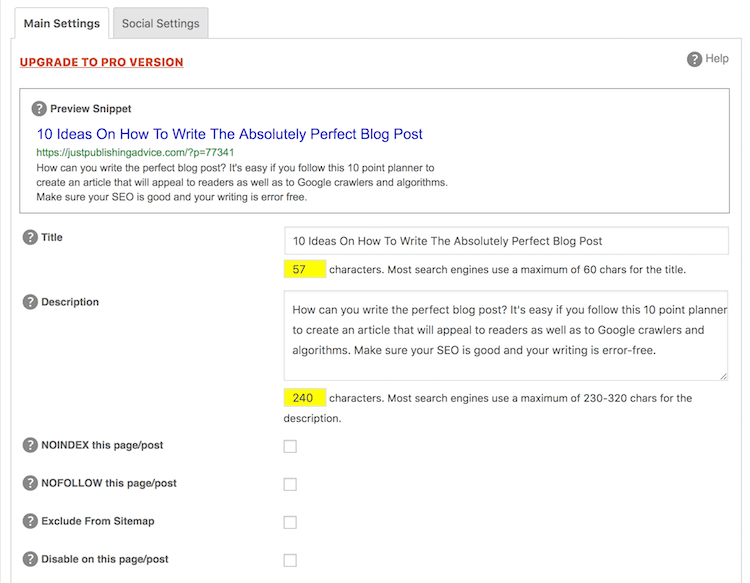 It took me years to understand how to write blog content that ranks on Google and Bing. I was a very slow learner. For way too long, I was under the impression that if I wrote a lot of words often enough, about anything, everything would magically happen. In a general sense, I was right. I got visitors to my blog posts, people read, added some comments, so I made a few friends and all was well with the world. Well, if 10, 20 or 30 visits to my blog each day was a sign of success, I was successful. But of course, I wasn’t. Then I started to learn how to write blog posts for readers who are searching for answers, advice and actionable information on search engines. Today, I get over 3,000 unique visitors to my blog every day, and sometimes more. That’s not bad for a small niche blog. So let me save you some time and give you my eleven step-by-step tips on how to write a blog post that will help you get more search engine traffic to your blog. 4. Make a list of semantic keywords. For some bloggers, finding blog post ideas to write about can be the toughest part. But there are easy ways to get inspiration and track down subjects that will resonate with readers for a new piece of content. All you have to do is look in places where people ask questions for topic ideas. a. Check your blog contact messages. Questions your readers ask you via your contact form are often gold medal ideas. b. Check your blog comments. It is one of my favourite and fastest ways to get an idea. c. Scan your emails. I get a lot of clues from what people are asking me, or trying to sell to me. Junk mail can even provide some ideas from time to time. d. Look for questions people are asking on Quora. It’s a fantastic site for finding questions people ask that you can instantly turn into writing topics. e. Run through your Twitter and Facebook notifications. Another excellent source of ideas. f. Read other blogs. Check blogs in your topic area and in particular, the comments. Steal, copy or better still, modify and improve on what you find. The idea for this post came from a comment on one of my earlier posts. Keyword research is vital if you want Google to index your blog post. 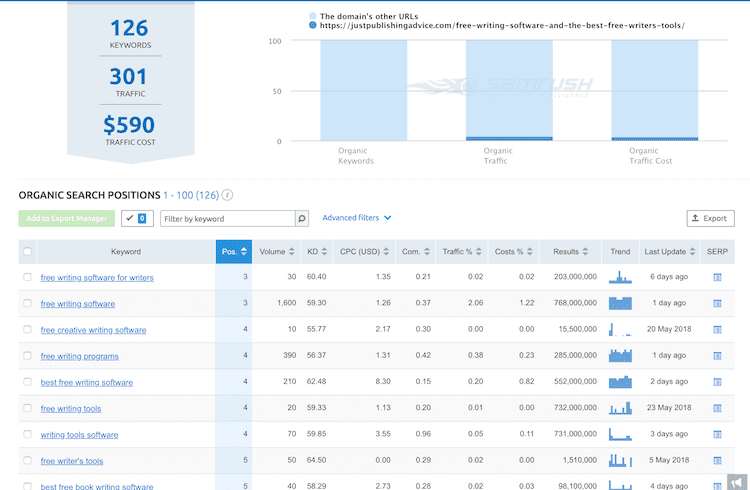 I use Semrush to analyse keywords and search volume. Surprisingly, my base keyword is not highly competitive and has reasonable search volume as you can see in the image below. 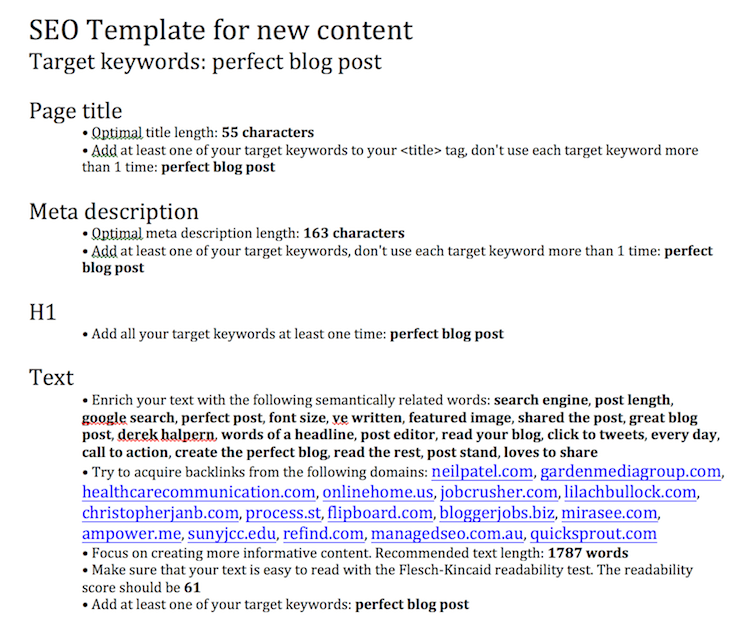 It also gives me a list of longtail keywords associated with my base keyword. There is also the option to search for questions related to my keyword. You can try a free keyword search or domain check in the box below. If you don’t have an SEO suite of tools, you can use Google for your SEO research to give you a few clues. When you search for your keyword, look at the bottom of the search page. You will get suggestions like this. The title or headline of an article is what is going to attract attention when people search. So it must be attention-grabbing to encourage them to read the rest of your article. I always use an online headline analyser to build the words of a headline, as well as an SEO title tag. I can check the length, the number of words and quality score as I experiment with my title. The image below shows the result I chose for my SEO title. While working on the titles, I discovered that adding the word “perfect” increased the quality score. So I added it to my base keyword. A base keyword is usually highly competitive. If you were writing on the topic of a new book, the words “new book” would fail to rank at all because it is far too general. What you need is a list of associated words and phrases that people are likely to use when they search. These are called longtail and semantic keywords. Again, Semrush makes this task easy. All I need to do is enter my keywords and let it go to work. The result is the outline I will use to write my article. It contains advice for my SEO tags, post length compared to competitive posts as well as a list of semantic and long tail keywords. There is also a list of suggested sites to gain backlinks. The image below is only a small grab, but the complete template report also includes the full text of the top 10 ranking articles for my chosen keywords. Very useful if you want to use the Skyscraper Technique. Again, if you don’t have tools such as this, make a list of at least 20 words and short phrases that associate with your base keyword. You can use Google’s related searches to help you. For me, this is the easy part. 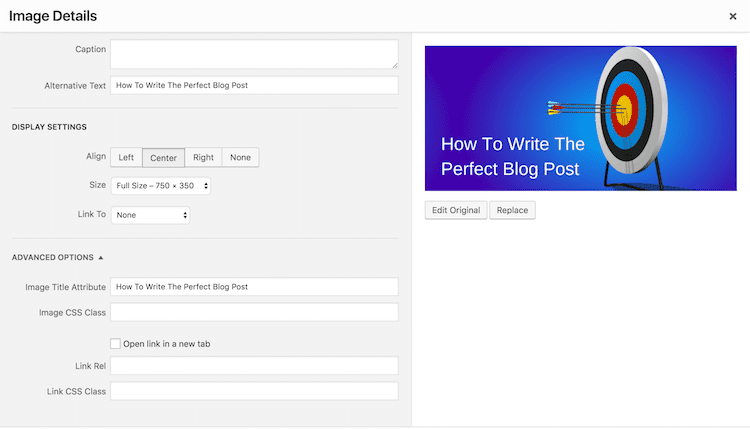 I’ve written blog posts in the past using Word, but I prefer to write directly into my WordPress post editor. 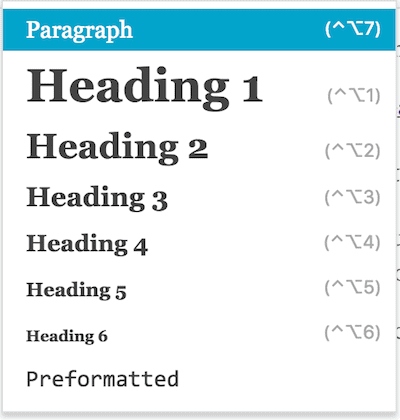 It saves on reformatting from Word and also allows me to add H2 and H3 headings, bullet points and format the font size or bold text as I write. There are two ways you can attack writing a great blog post. One is to write and not worry about anything except what you want to say. I generally start by writing the paragraph headings first that I think will grab a reader’s attention and then fill in the gaps. The second way is to use your list of associated keywords as a stimulus for each part of your text. You can re-order later to get a better flow. Whichever method you choose, the primary focus should be on who will read your blog. Talk to your readers as if they were sitting in front of you. Keep it personal and avoid the third person and the passive. Once you have finished writing, go back to your keyword list and make sure you have used every one of them. If not, add a few more sentences to your text. Now it’s time for a thorough grammar and spell check and a first edit. Because I write a lot, I use Grammarly every day to make sure my writing is as error-free as possible. 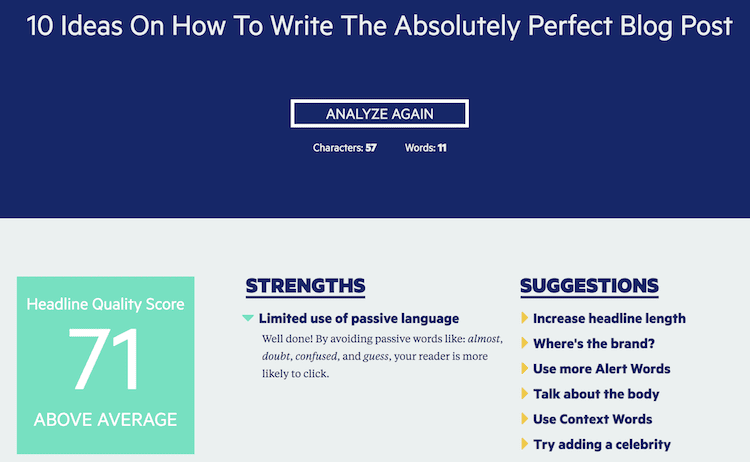 I also use ProWritingAid for longer blogs because it is more like a virtual writing assistant that a simple grammar checker. It’s not 100% perfect, but it finds the most common errors and also helps me reduce the number of passive sentences and repeated words. For me, it’s a huge time saver. But I still do two or three meticulous proofreads after that and check that I have used short paragraphs. You might have written the perfect post, but without any images, it will look very unappealing. A featured image is an absolute must in good blogging because everyone loves to share images on social media. Great graphics attract attention and shares. Your image should tell potential readers what your post is about and at the same time make them curious to want to read more. Additional images throughout your article can be used to illustrate a point or to decorate and break up the text. Reading online is different from a book or magazine. Your text needs to be broken up with lots of white space and images help add colour to this use of white space. Never steal or copy images from the Internet. Make sure you use unique images. It’s easy to do. I use Canva to create featured images or use my own screengrabs or photos. 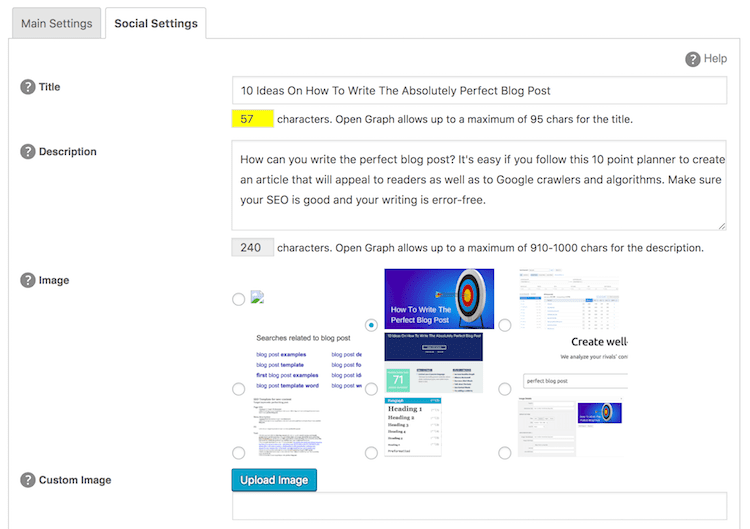 You can create the perfect blog post, or content marketing article but without on-page SEO it will struggle to be noticed by Google’s crawlers. You write for your readers, but you have to add SEO for algorithms. What do you need to do? Here’s a checklist. a. Add H2 and H3 text tags. You can do this in your post editor. Choose H2 for your subtitle and H3 for your paragraph headings. You should never add an H1 heading, as this is usually done automatically when you add your title to the title box in your editor. If you want to make a heading larger, increase the font size. b. Add SEO attributes to all your images. There are a lot of fields in your image properties box. Make sure you add Alternative text and Image Title Attribute. These help Google image search. You can also add a link, and choose to open in a new tab. The Link Rel field is where you can add nofollow. This is useful if your image is to an affiliate link. There is a field to add a caption if you want to. Useful for adding credits if you need to do this. c. Write an SEO description and title. If you have an SEO plugin, use it. I use All In One SEO, but you can also use Yoast. This is where you write exclusively for Google and Social media. Nothing you add here will appear in your post, but it will appear in Google search and on social media shares. There are a lot of settings, but the most important are Title and Description. Note the character counts that are permitted and use as close as possible to the maximum. In the Open Graph settings, you can also select your preferred image to be used on social media. d. Select your categories. If you use categories, these are usually included in your sitemap. Google will index category pages, so make sure you select at least one category for your post. Two is better. A good habit, especially if you are writing an evergreen blog post is to add supporting links to external pages. These give a reader added value and help build trust in your blogging. Select sites that can help readers, such as online tools or a page that offers an in-depth explanation of a topic you raised in your post. If you use Twitter, include a click to Tweets if you want to. Add your affiliate links if you have any to use, but don’t forget to mark them as nofollow links. Never give a dofollow link to a sales link, paid or sponsored link or even to social media mentions. You should also add internal links to a few of your earlier articles. This is a very good SEO practice to use because it will help you keep readers on your blog for much longer. After you publish your new article, you will need to add some links to it from your existing articles. No way! There is a lot to do after you press the publish button. First, read your blog post one more time. It’s amazing how the fact that it’s now online and available to the world makes your eyes a little more keen on finding boo-boos. You can correct any small typos quickly and avoid attracting the attention of the Grammar Police. At the same time, check that all your links work and go to the right places before hitting publish. It will take a couple of weeks for Google to find your new article and index it. It will take even longer to add query keywords. Because page views and social shares will help your article rank, get as many as you can from social media. Share your post everywhere, and on some networks such as Twitter, do it 2 or 3 times on the first day. After you have shared the post, wait a few days and share it again. In fact, you should never stop sharing your articles. Organic traffic will probably be your largest source of blog visitors, but social media is still important. In my case, it accounts for about 20% of my blog traffic and has been steady at around that percentage for a long time. 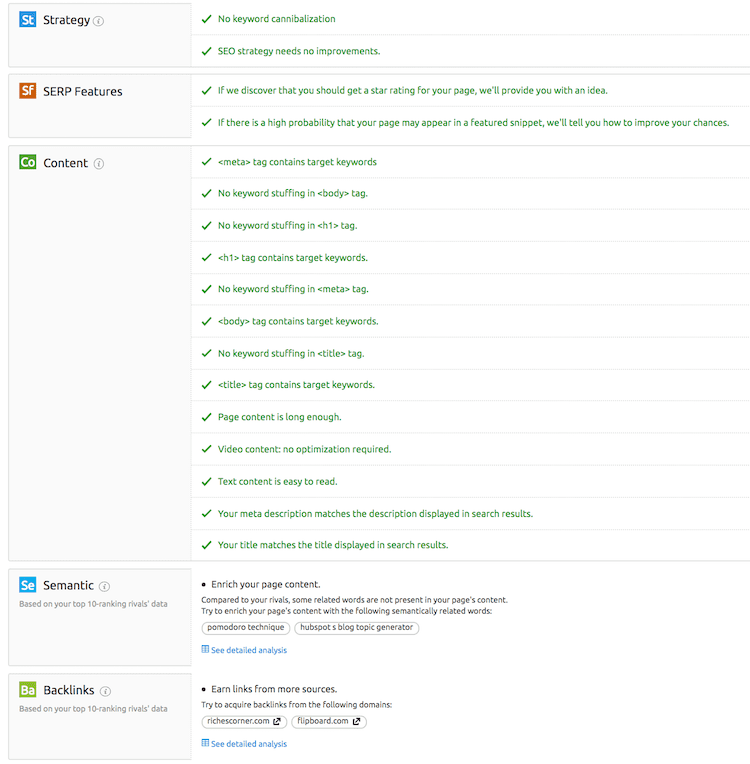 After a couple of weeks, you will be able to check your progress with Google Search Console (GSC). Here is an example of a post I published a little over a month ago about free writing software and tools. The first step is to go to Search Analytics and select Pages to find your new article. You can see in the image above that my post has gained 441 clicks in the last 28 days. Not bad. But we need to dig deeper. 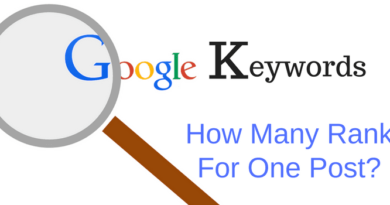 Once you do, you will get a list of all the keywords that Google has assigned to the page. I have truncated the image above because it was too long to show in this post. But you can see that in only a month my article has gained 425 search keywords. Of course, not all of these will gain a high ranking. In fact, most will not. But if you look at the click count on the right, it is clear that the top six are doing very well. The only problem with GSC is that it doesn’t give any information on keyword rank. With Semrush, I can get far more detailed information to help me understand what Google has done. 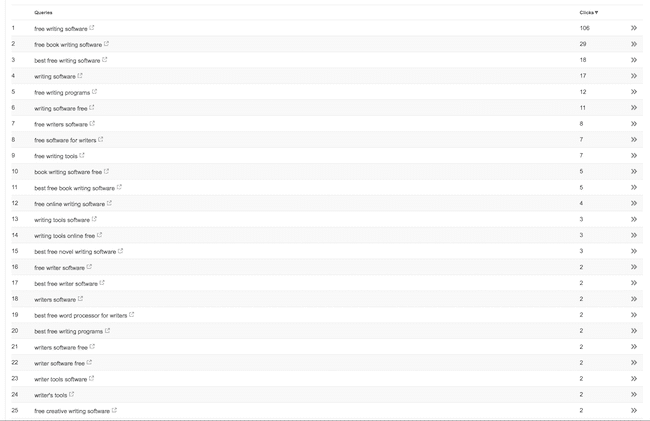 My post has 126 keywords ranking higher than 100, with 18 in the top 10. I can also check if I need to make any improvements. Well, there is always more you can do to improve a post. The most important green tick in the image above is no keyword stuffing. When a keyword is repeated too often, it is classed as stuffing and can result in a Google penalty. But the suggestion to add a mention of Hubspot is a good idea. As the expression goes, rinse and repeat every month or so to see if there are any improvements that you can make to your new articles. Never let a post stand still. Updating blog posts from time to time is a very good SEO practice because freshness is a Google ranking factor. It is not rocket science to write the perfect blog post. It takes a little planning, time in writing and adding good SEO elements. Never rush it. A great article can work for you for years in getting blog traffic and people to react positively to your call to action statements. Will every post you write using these tips rocket to number one Google ranking? No. Of course not. But they will help you get some of your keywords up there, or at least onto the first search page. If you can get a dozen or so of your blog articles ranking for keywords in the top ten, you will get plenty of organic traffic. If it takes you hours or even days to write your next blog post, it will be very worthwhile in the long term. This is a good read. I use Grammarly too for my everyday writing. I think is one of the most important tools for authors. 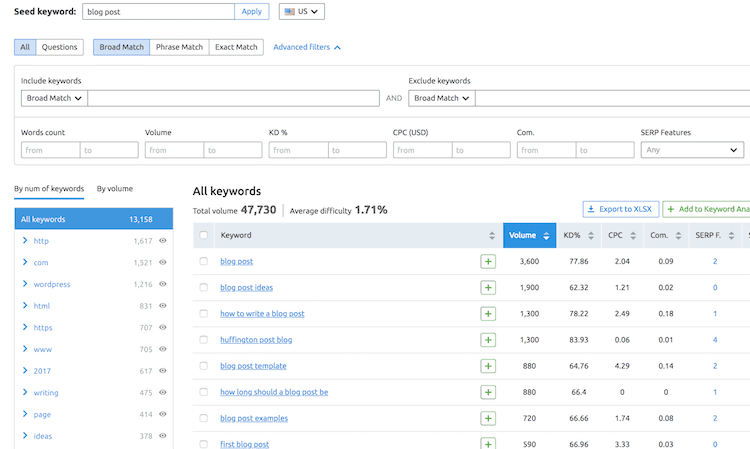 Google keyword tool is my favorite although I have used Semrush for a short time in the past. A very useful tool for keyword research.